Game Show Memories – Bob’s Your Uncle. 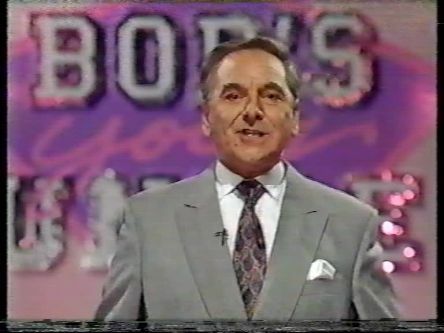 As I am currently taking a look back at some game shows hosted by none other than Bob Monkhouse during his long career I’ve decided that it’s now time to review Bob’s Your Uncle. This was a Saturday night show where three newlywed couples battled it out by playing various fun games to be able to compete for the star prize. The show would begin with Bob and yet more of his great jokes. Then the couples would come on stage one by one to talk to Bob and play the first round. Some people are asked a question and then we see some of their responses. If the couple guess what the most popular answer was out of the choices then they win something that will come in very handy for the next round. The show becomes rather silly now when in the next round the teams enter the Sea of Matrimony. All three couples are now in a boat with holes in it in a pool. If they got the question in the first round right they have a water pump which will help bail them out. If they got the question wrong though they have a heavy cuddly toy which will weigh them down. They are then asked more questions. If they get one wrong, another person joins them in the boat which could cause even more problems. The first team’s boat to capsize and leave them with that sinking feeling is eliminated from the game. After the break, the two remaining teams return to the studio to take part in the next game. There are pictures of ten celebrities and then a statement is given, which is true for some celebrities and false for others. The teams then have to run around for 90 seconds to try and slot the pictures in the correct places, scoring points for every one they get correct. The highest scoring team goes into the next round. The one remaining team win £1,000 and then take part in another physical game. This one features comedy oversize props and they have to complete a challenge in two minutes such as hammering some nails. If they are successful, their money is increased to £3,000 and they can now play for the star prize in the final. 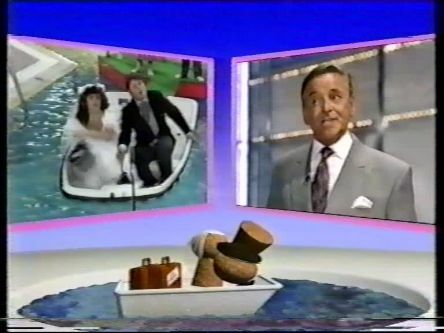 The final was very similar to another Bob-hosted game show The Golden Shot. 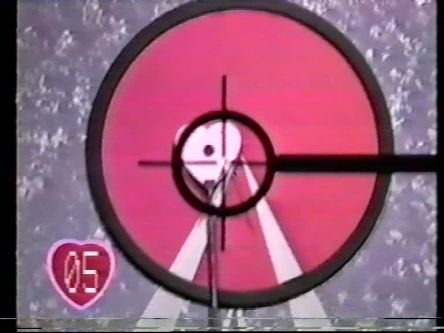 The couple had 30 seconds to hit the target, having to “put the dart in the heart” as Bob described it, with one instructing the other who was blindfolded. If they did it they would win the star prize of a car. But if not, they just took the money that they had won. Bob’s Your Uncle was produced by Central and ran for two series on ITV. I must admit this isn’t one of the more fondly remembered game shows that Bob hosted but I do remember watching it myself and enjoying some of the creative and unusual games, and Bob was as good value as ever. There is no Wikipedia entry for the show though surprisingly. After the show ended Bob went on to host a revival of Celebrity Squares and that will be the next game show that I’ll review.